I like how the M3 looks very sporty and aggressive without the styling going too over-the-top or flashy. It continues to retain most of the design elements of the 3-Series but you do get some bits that distinguish the M3 from, say, a 320d. The front and rear bumpers get scooped out curves while you also get a bigger and rounder air dam up front. At the rear, you get quad exhausts which again reveal the sporty intentions of the sedan. The side profile is more or less similar to the regular 3-Series but you do get low profile tyres wrapped on smart looking alloys. The ORVMs also get a new shape which seems to be more aerodynamically friendly. Apart from that, you get air vents with ///M badging on the front fenders. Even on the inside, a lot of major components are shared with the regular 3-Series sedan. The dashboard continues to retain the same driver-friendly layout. The dash comes in a shade of black along with doses of carbon fibre spread across the inlays. The centre console carries a similar layout as the 320d but what’s different are the few additional buttons on the side that let you adjust the settings for the steering, suspension, etc. You also get M-Sport seats which are too damn comfortable and provide a good amount of support to your body parts. The rear seats too are quite firm and supportive but leg room is just about average. All round visibility is pretty good and ergonomics are also well-sorted. The rear-wheel-drive 2017 M3 packs a turbocharged 3.0-liter inline six-cylinder engine that cranks out 425 hp and 406 pound-feet of torque. Two transmissions are available: a standard six-speed manual with automated rev-matching or an optional seven-speed, dual-clutch transmission (M-DCT) with steering-wheel-mounted paddle shifters. According to BMW, the M3 with M-DCT can sprint to 60 mph in 3.9 seconds, and the six-speed will do the trick in 4.1 seconds. In Edmunds performance testing, a six-speed BMW M4 coupe (very similar to the M3 but with two fewer doors) needed 4.4 seconds to hit 60 mph. Note that the six-speed lacks launch control, making the launch procedure more trial-and-error-based; the M-DCT has it as standard. 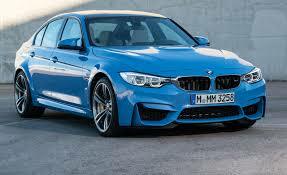 The EPA estimates that an M3 with the standard manual transmission will deliver 20 mpg combined (17 city/26 highway). Opting for seven-speed M-DCT lowers those numbers to 19 mpg combined (17 city/24 highway). Automatic engine stop-start, which shuts off the engine to save fuel while the car is stopped, is standard on every M3. The sedan can accelerate to 100km/hr from a stationary start in just 4.1 seconds due to 7-speed M DCT with Drivelogic. The M Dual Clutch Transmission with Drivelogic is an innovative feature with 7-gear dual-clutch system specially designed for BMW M high-rev engine. There is an automatic gear selection based on the traction involved. Ultra-light materials such as magnesium, aluminium and Carbon fiber reinforced plastics are used in the building of many essential components thus, making the car light in weight. It improves the acceleration as well as braking of the sedan.Being a racing car, the M3 sedan has an impeccable braking system. With their unbeatable precision, the M Carbon Ceramic brake system and the M compound brakes ensure the best performance. The braking power is more directly enforced through the M Carbon Ceramic brake system. The corrosive tendency of the brakes is low, and it tolerates more heat, thus lasting longer and making the car one of the most durable ones in the motorsport industry. Key features that constitute braking system in M3 saloon are anti-lock-braking system with brake assist, cornering brake control and dynamic stability control including M dynamic Mode. Safety brigade includes a string of features vouching for safety of occupants, these are- front airbags for driver and co-passenger, knee airbags, head airbags equipped in front and rear and side airbags for driver and front passenger. Other potent safety equipments incorporated in the vehicle are electronic vehicle immobilizer, ISOFIX child seat mounting, run flat indicator, mechanical childproof lock, side-impact protection, three-point seat belts at all seats including pyrotechnic belt tensioners and belt force limiters in the front, warning triangle with first aid kit, crash sensor and dynamic braking lights and spare wheel. But buying an M3 isn’t about the price right now for there is no competition till the new C63 AMG is introduced. And even when it is, unless your best friend buys the latter and challenges you to a track duel, you’d be more than happy in the M3. It is a special car even without a thunderous engine note, could shame a few AWD cars with its corner carving prowess and can do duties of a family car if need be. The M3 is the car for the young, rich, quintessential petrol head family man.